Picking out my dream home in Mexico City. Have you ever visited a new city without any agenda? Me and some friends did just that on a recent trip to Mexico City. A group of us from all over the United States planned a last minute trip over a long weekend with the sole intention of eating tacos, sipping mezcal and exploring a city we’d never been to before. The trip was a success. We found so many amazing spots and in this post, I share them with you. Read ahead for my tips on what to see in Mexico City in 3 days. Mexico City's abbreviation is CDMX (Ciudad de México). Growing up, I always thought of Mexico as a beach and resort destination. My friends and family would talk about visiting Cancun, Acapulco and Cabo, but never landlocked cities such as Mexico City. My first trip to Mexico was during Spring Break of 2007 at the Copacabana hotel in Acapulco with 200+ members of Penn State’s greek life and my second visit was a weekend in Tulum. After college, I moved to Phoenix, Arizona and taught high school math as a part of the Teach for America program. Over 75% of my students were from Mexico, and I learned a lot about Mexican culture from them. They would bring me homemade tamales from their grandmother’s kitchens and invite me to their quinceañeras to celebrate with their families. The more I connected to my students, the more interested I was in visiting the Mexico that they knew, away from the all-inclusive resorts. Mexico City is a colorful, vibrant place with incredible food, live music, museums, historical sites and delicious, smoky Mezcal. I had my camera attached to my face every time we turned a corner and spotted a bright house or creative piece of street art. I fell in love with this city during my trip and am already planning to go back for another long weekend. 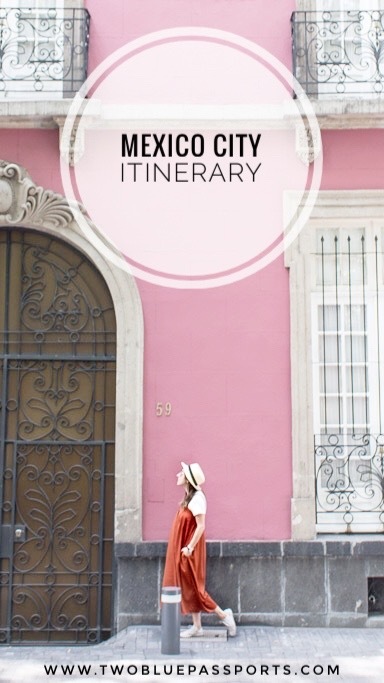 I hope this post inspires you to plan your own adventure to Mexico City! Cute cars & cuter houses on the streets of CDMX. The Mexico City skyline from Chapultepec Castle. The Chapultepec Castle is the only royal castle in the Americas. It’s located at the top of the Chapultepec Hill in Mexico City and has a rich history dating back to the 1700s. It was built for Bernardo de Gálvez, a Spanish viceroy, but was abandoned during the Mexican War of Independence and left vacant until 1833. In 1847, it was the location of the Battle of Chapultepec during the Mexican-American war. At the entrance of the castle, there is a large monument dedicated to the “Hero Children” (Niños Héroes) who died while defending the castle from the United States. More recently, the castle was a location for the movie version of William Shakespeare’s Romeo & Juliet starring Leonardo Dicaprio and Claire Danes. Accessing the castle is a bit of a hike but once you're at the top, you are rewarded with some of the best views in all of Mexico City. 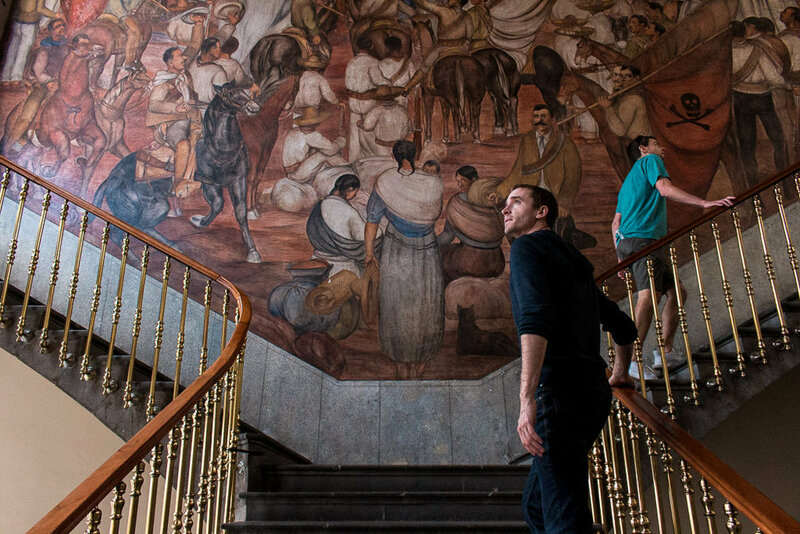 Inside, you can explore the National Museum of History and enjoy large murals and artwork throughout. The castle is open from 9am to 5pm Tuesday through Sunday and costs 64 pesos (~3.50 USD). Expect to spend about one to two hours there. A rooms inside the castle. The niños héroes monument at the bottom of the Chapultepec Hill. My friends Dom & Tom admiring the murals. Parque España is a lush park situated in the Colonia Hipódromo neighborhood of Condesa. It dates back to 1921 when it was created to honor the 100th anniversary of the Mexican War of Independence. I walked through this park a few times during my time exploring Condesa and really enjoyed the monuments. My favorite feature of the park is a large statue that resembles a hand. The statue was built to welcome Spanish immigrants to Mexico. Parque Mexico dates back to 1927 and has been recognized as a part of Mexico City's heritage by the Instituto Nacional de Antropología e Historia (INAH). It is located only a few blocks away from Parque España. It once was the location of a horse racing track and is now a lush park in the center of Condesa. Take a stroll through the park and watch children play soccer near the Lindbergh Open Air Theater. Gorgeous flowers in Parque Mexico. As I mentioned above, eating tacos was at the top of my bucket list for Mexico City. A friend of mine looked into Airbnb experiences and we ended up booking a four hour bike ride & taco tour. The total cost was under $50, and we were taken to three different local taco spots around Mexico City. Our host, Bobby, also showed us street art and taught us the correct way to drink mezcal. It was an awesome experience that I wouldn’t have been able to recreate myself. You can check out this experience and more on Airbnb’s website. This street art car sits outside of Hotel Condesa DF. It used to play music if you wind it up, but it stopped working after the 2017 earthquake that hit Mexico City. 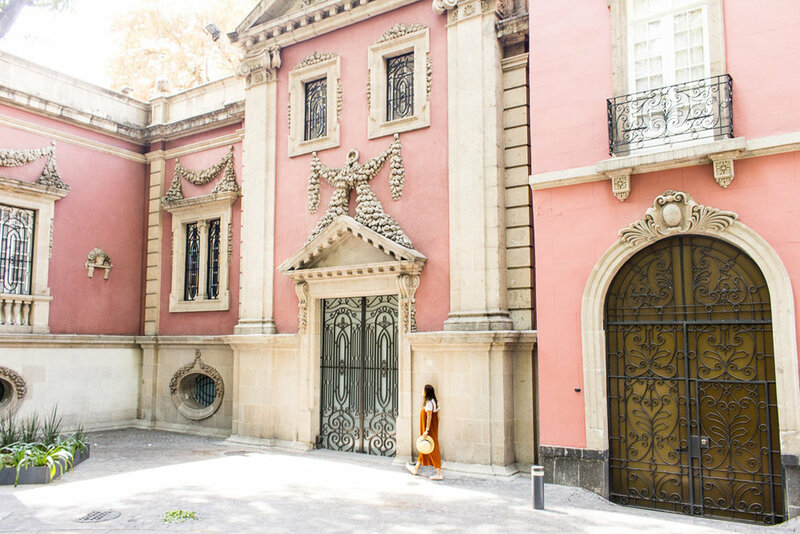 Mexico City is the home of Luis Barragán's home, now a museum, dating back to 1948. It is an architectural masterpiece and part of the UNESCO World Heritage list. My biggest regret of my Mexico City city trip was not planning far enough in advance to book tickets myself, so I was unfortunately not able to go. I had to include it in this post though, because it is a must see for anyone visiting Mexico City. It is available by appointment only and costs 400 pesos (~22 USD). It books up about a month in advance, so plan ahead! Mexico City's food and drink culture is incredible. From the most delicious tacos to smoky mezcal cocktails, you can expect to spend a lot of time indulging your taste buds. In the next section, I'm sharing where and what to eat during your 3 day stay in Mexico City. Drinking coffee and eating danish at the Plaza Rio de Jinero. In this section, I'm breaking down where and what to eat and drink in Mexico City. For easy browsing, I've separated my recommendations into Coffee Shops/Breakfast spots, Restaurants, Bars and a specific section for TACOS. Who loves tacos? I love tacos? Go to Mexico City and eat all of the TACOS. Panaderia Rosetta is a tiny bakery with the most incredible pastries. Stop by one morning before you start a day of exploring and order a coffee and guava danish (or two). The panaderia is only a few blocks from Plaza Rio de Jinero so you can walk to the park and enjoy your breakfast by the fountain. Did you know I have the same thumb as Megan Fox? But also, this guava danish was insane. Mexico City has a lot of great coffee shops, but I really liked the atmosphere of Cucurucho. It was upscale but still felt local and the coffee was delicious. Stop by here for a cup of joe before exploring the city. I stumbled upon Amor Ti Amo on my second day in Mexico City when I really needed a mid-day cup of coffee. It is family owned and has an adorable patio where you can enjoy your coffee. It also offers a variety of smoothies and juices. My friend Jess & I outside of Amor Ti Amo Cafeteria. Chiquitito Cafe was another favorite coffee shop that also serves breakfast. Order a ham and cheese croissant, fresh yogurt and granola and your breakfast drink of choice. If this was my local coffee shop; I would sit here for hours and blog while sipping matcha lattes. Enjoying the street art all over this beautiful city. For meat tacos, visit Parnita and order the pastor taco. I stopped by during happy hour on Friday and it was packed with locals sipping mezcal and munching on tacos. There is a park-let outside that you can sit at if the weather is nice, or you can enjoy the home-like atmosphere inside. If you prefer fish, stop by El Pescadito in the Condesa neighborhood. The fish is perfectly cooked and pairs deliciously well with a crisp Mexican cerveza (beer). The shrimp tacos are also a must try. Por Siempre is a vegan taco truck that serves incredibly fresh tacos. They have a variety of fake meat and cheese opionts, but I tried the mushroom taco and did not regret it. The Gringa taco was also incredible. 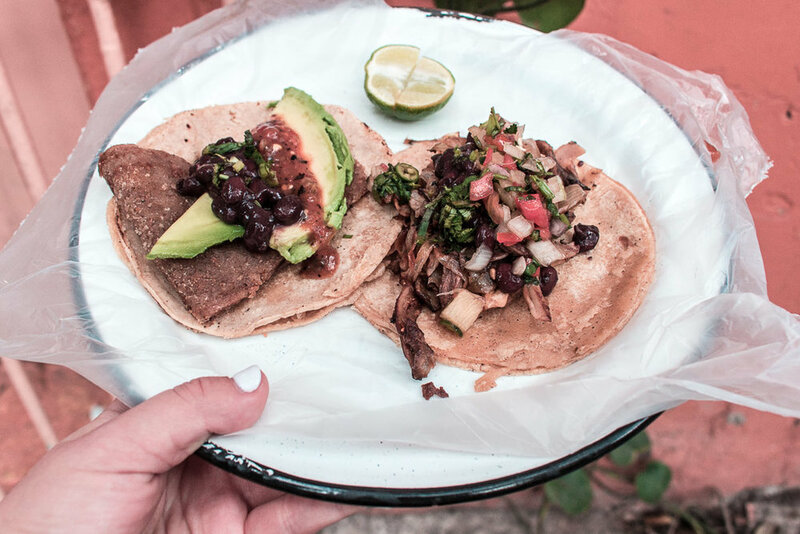 Meatless tacos from Por Siempre in Mexico City. Pithaya is another vegan taco shop. I don’t know how I ended up at two different vegan taco places in the 3 days I spent in Mexico City, but both were absolutely delicious. Pithaya has less traditional tacos and was more unique in flavors. While Por Siempre tried to make a vegan taco that was close to the real thing, Pithaya decided to go completely off the standard menu and serve tacos topped with cauliflower, strawberries and quinoa and more, all served on a bright pink taco shell. Fresh vegan tacos from Pithaya in Mexico City. Bowie is a restaurant that was definitely named in honor of David Bowie. I didn’t realize this until I showed up and there was a huge mural of Bowie on the wall. My friends and I went here for brunch on Sunday before our flight out and really enjoyed it. We sipped champagne and ordered the most delicious zucchini spaghetti. I highly recommend visiting Bowie for brunch, lunch or dinner during your time in CDMX. Mercado Roma is a funky food court with great restaurants, a famous chocolate shop, a fresh churro stand and a rooftop bar. Need more convincing? There's even a huge succulent wall on the inside. I came here twice during my time in Mexico City. The first was to have a drink at the rooftop bar. The second was to eat so many fresh churros until I became a churro myself. One of the incredible food stands at Mercado Roma in Mexico City. Azul Condesa is an upscale restaurant that was recommended by our Airbnb experience host. I often find the best recommendations come from locals, so we made a reservation right away and went for dinner. They have an incredible tortilla soup, decadent mole dishes and delicious cocktails. I'll definitely be making another reservation for my next trip and encourage you to do the same. Rosetta is an Italian restaurant in Mexico City. When my friend recommended we go here I was not initially on board because I wanted to save room for more tacos. If I wanted Italian food, I would go to Italy or call my very, very Italian grandma. After looking at some reviews, I decided it was worth missing a taco meal and am so glad I decided to eat here. I decided to go all in by ordering a gnocchi dish and it exceeded my expectations. If you're open for a different cuisine during your time here, make a reservation. Condesa DF is a chic hotel right next to Parque España. The hotel sits on a corner and is built around a triangular courtyard restaurant, so the views from the top are a designer’s dream. Ride the elevator to the top floor and take a seat at a table or lounge to enjoy the sunset. I spent hours here one evening ordering mojitos because I loved the atmosphere so much. The rooftop bar at Hotel Condesa DF in Mexico City. Departamento is best known for it’s club, but there is a bar attached to it that has a booths and live music in a more casual setting. Whether you want to dance the night away or sip a mezcal cocktail and listen to vinyl, add Departamento to your list for night life activities. I know I’ve mentioned mezcal a few times in this post, but my personal favorite drink is a gin martini. Gin Gin is the perfect atmosphere to have a cocktail before or after dinner, listen to some music and people watch. A home in the Condesa neighborhood of Mexico City. After asking for recommendations from a few friends, I decided to search for an accommodation in the Condesa and Roma areas of Mexico City. Condesa and Roma are filled with restaurants, cafes, bars, art galleries and gorgeous architecture. Both neighborhoods are safe and walkable, with a lot of activities. 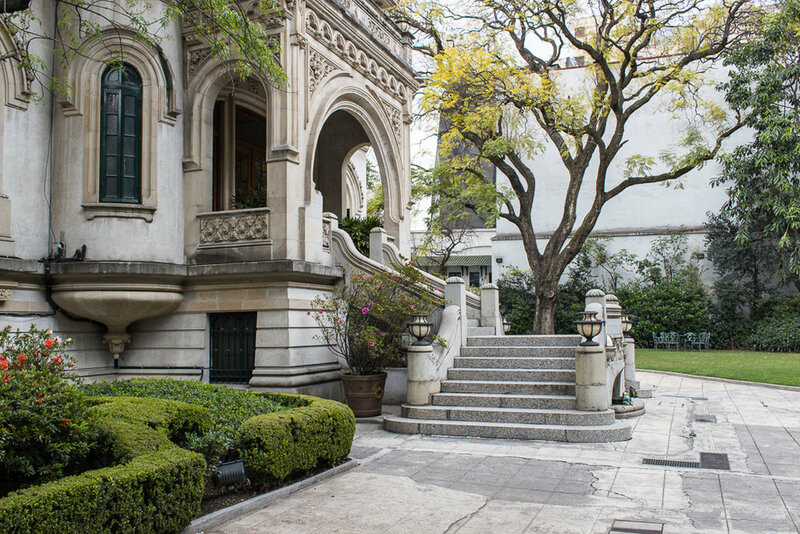 Parque Mexico and Parque Espana are in the Condesa area as well as my favorite hotel, Condesa DF. Roma has amazing shopping and is really upscale. Roma is the area of town that the wealthy residents of Mexico City migrated to move away from the crowded colonial center of the city in the late 1800s. We stayed our first night in Condesa and the next two in Roma. Here are some options for where to stay during your visit! Mexico City is a great city to try an Airbnb. There are a ton of options in Condesa and Roma so I’ve put together an Airbnb Wishlist to help narrow down to some of the best. If you’ve never used Airbnb before, use this link to sign up. Condesa DF is recommended above for their rooftop bar, but is also a great option for a hotel. A room will cost you around $250 a night, which in my opinion is well worth the stay. It’s in a great location and the decor is every Instagrammer’s dream. To check out more hotels, use the search bar below. > Getting around in Mexico City was a breeze. The Condesa and Roma area is very walkable, but you can also use Uber, a car sharing service, for a very low cost while you're there. > Mexico's currency is the peso. The peso is equal to about 5 cents in USD and Mexico City is a very affordable city. I exchanged money at the airport and used an ATM while in the city. You should not have any problems exchanging currency and most businesses accept credit cards. > Don’t drink the water in Mexico City. There are Oxxo convenience stores on corners throughout Condesa and Roma so you will have easy access to bottled water. I recommend avoiding ice as well, unless you ask the restaurant and trust them that it’s filtered. > I mention this above, but I was really disappointed that I missed the Luis Barragans museum. My trip was planned so last minute that I wasn’t able to get reservations. I recommend booking at least 1-2 months in advance to ensure you can get a ticket! > Mexico city sits a high elevation and is significantly colder than the popular Mexico beach destinations. The weather in February was beautiful and not too hot or too cold, but check the weather in advance to ensure you’re packed appropriately. Bring layers out with you during the day because once the sun goes down, it can get chilly any time of the year. Check out more posts from Two Blue Passports!